Dennis Edwards – a legend in his own Flower Market lifetime – finally has his own name above a stand at New Covent Garden Flower Market. When I went to see Dennis and his expert flower salesman Edwin "Eddy" Martin in Week 2 of Dennis Edwards Flowers (by Door 1 next to Whittingtons), the stand was already buzzing with customers swarming over the displays of stunning and interesting flower varieties from Italy, Holland, France and South America. Dennis clearly has an eye for quality, and seems to gauge perfectly the range to inspire his discerning florists. Dennis Edwards Flowers' diverse customer base includes event florists, stallholders, high street florists, wedding specialists and contract florists. Event companies also entrust them with export orders, which Dennis coordinates with a practiced hand. Says event florist and former owner of Kensington Flowers, Angela Bruce, "Dennis is one those traders who will really listen to what you want, and will do his utmost to find it for you. If it just isn't there, he will always present you with excellent alternatives." Perhaps this is why the company has got off to such a flying start. Says Dennis, "Trust goes a long way in this business, and I have been in it a long time. Customers have been very supportive, and starting out again has given me a new lease of life!" When Dennis started work at the age of 17 for WH Moss it was supposed to be a year-long trial. Over 45 years later he remains a dedicated Flower Market man, now President of the Tenants' Association after ten years as its Chair, and hoping to be around for the move to the new Flower Market: "There won’t be many who can say they have worked in all three markets!" laughs Dennis. Despite being the third generation of a family of fruit and veg traders, Dennis preferred the atmosphere of the Flower Market from the word go. "It was much friendlier," says Dennis. "You worked alongside your boss rather than for him." After WH Moss, Dennis went on to work for Bacon & Duguid and Charlie Gardiner (describing his various roles in typical Dennis fashion as "standboy, porter, buyer, salesman, gigolo…..!") before starting John Austin Flowers in 1988 with business partners David Donovan and Lee Ward. In the first year of trading, the business rocketed from a turnover of £100k to £4million and John Austin Flowers became one of the most respected flower wholesalers in the UK. "I have sourced the flowers for so many significant events including the lily of the valley for Kate Middleton's bridal bouquet and flowers for Princess Diana's coffin, but I am proudest to have donated the 3000 red petals for the 9/11 Remembrance Service at St Paul's Cathedral." Dennis was Chair of the Tenants' Association for over 10 years and now, as President, supports Barry Porter in his role as Chair. When he left John Austin 3 years ago "over a matter of principle", Dennis worked happily for Bobby Armitt at Alagar before deciding to strike out anew. 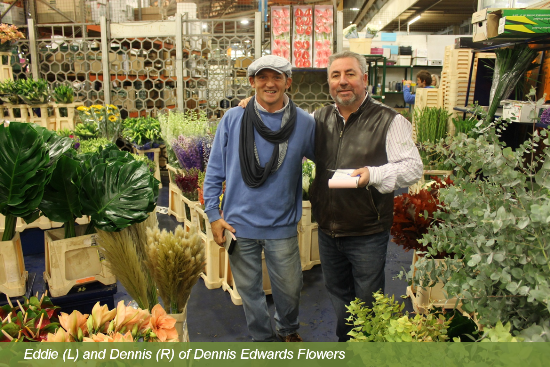 Dennis has known his new business partner Edwin Martin - or "Eddy" - since Eddy started in the Flower Market at the age of 15, and is great friends with Eddy's dad. Eddy is a familiar sight around the Market, generally see him sporting one of his trademark hats. He worked for J. Colinridge, Charlie Gardiner, Goodchilds (with a break to play professional football in Sweden) before throwing in his lot with Dennis Edwards this September. "The market is your life, and life becomes a breeze!" says Eddy. "You learn a lot about life and people by working here. The hardest bit is getting up so early!" Dennis's favourite flowers? "Icelandic poppies from San Remo, English violets and dark red 'Dennis' doris pinks," replies Dennis without a second's hesitation. Poppy and Violet are the names of his granddaughters, and Dennis is the name of his baby grandson born this September. Visit Dennis Edwards Flowers at www.dennisedwardsflowers.com or call 0207 498 5655.